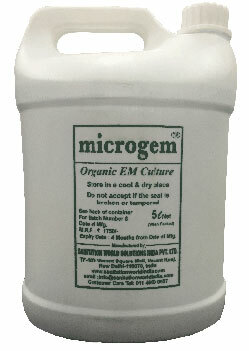 microgem ™ is an organic bio-culture, certified by the CSIR Indian Institute of Toxicology Research, Lucknow, developed and manufactured by Sanitation World. Application of microgem ™ promotes a safe and hygienic environment in surroundings that are infested with harmful bacteria, flies, mosquitoes and a strong smell of sewage. Use of microgem ™ transforms communities that are plagued with harmful sewage, flies and smell. Sanitation World has operations in several countries including India and South Africa. Following the launch of Sanitation World India in 2013, microgem ™ is now manufactured in Delhi NCR with a national distribution presence. With a well trained team we provide all support, technical or otherwise, to ensure the successful application of microgem ™. microgem ™ was developed in 2004 by Sanitation World South Africa and has received several awards for its social innovation including the SAB Foundation Social Innovation Award as well as being recognised as the best innovation at the 5th South Asian Conference on Sanitation (SACOSAN) 2013 Nepal, an inter-ministerial conference on sanitation, where the best sanitation innovations in South Asia are adjudicated.